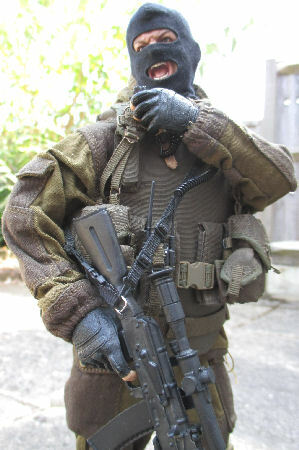 After making my other spetsnaz figure, I had the spares left over as well as the pieces from the other KGB Hobby 001-A boxed set. One thing I have just noticed with this figure, is that somehow I have got the uniforms mixed up from the two sets. 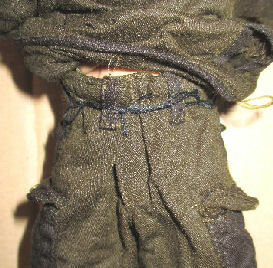 And the tunic top for this figure is shown in Picture 1. which is a pullover type, that came with Set 001-A. Whereas the other tunic in Picture 2. has a full length flap in front, and this came with the 001-B set. In Picture 4. I have made an alteration to the neck of the 001-A tunic as it was opening too wide. So I cut three slots in the flap as buttonholes, so that I could push the buttons through with my pointed tweezers, and it would fasten the collar together. 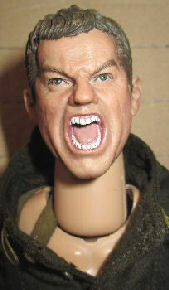 The headsculpt for this figure, which is shown in Picture 3. was made by DAM for the USMC reconnaissance rifleman. I will be giving this a pastel wash as usual, but I am not sure how much of it will be shown. 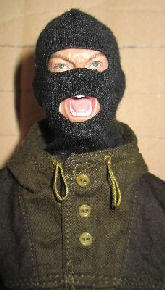 Because I am using the balaclava as in Picture 4. with this figure. 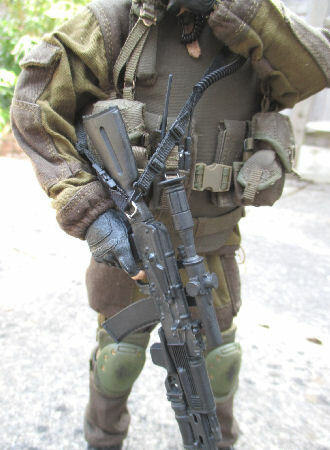 The body I used with this figure is again a Very Hot narrow shoulder one, I have also had to use an adapter so that I could use the DAM head on this body. This is shown on my other page - DAM Adapter. I also wanted to use the DAM hands with the Very Hot figure, but I found that the pegs that fit into the wrist joint are a little bit loose. So I have had to put some Poly Glue 'Mix' as shown in Picture 5. below onto the hands wrist pegs, which I let dry for 24 hours so that the liquid plastic hardened to make the peg larger. So that when I fitted it back into the Very Hot body wrist connections, they now have a tighter fit onto the body. Note: Poly Glue 'Mix' - This pot 31. is a mix of the poly glue and scraps of plastic such as sprue added to it, the purpose of this is that the glue melts down the plastic over time to make a liquid plastic. 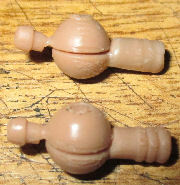 Picture 6. shows two of the Very Hot wrist pegs that came with the hands, the bottom one is before I have added the glue to the peg. The top wrist peg has had the glue applied to it to bulk it out, so that it will now fit better and tighter into the Very Hot figure's wrist joint. The other smaller end of the Very Hot pegs in Picture 6. will fit into the DAM gloves but they are unfortunately slightly loose, so I have had to glue them in place. 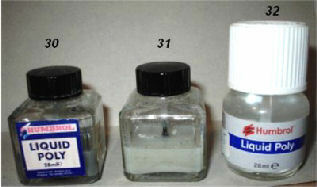 Picture 7. shows the glue I used which is stronger than superglue, which I have found that it does not work well with these types of plastic. With the uniform for this figure the first thing I did was to give it a wash with some hot water and clothes washing liquid in a jug, the purpose of this is to lose the stiffness of the material as shown in Pictures 9. & 10. It was then put onto the figure to dry so that I could get the creases set into position. I have had to use some strong thread in Picture 11. through the trousers waistband, because I found that the trousers were too big for the Very Hot body. So I have had to tie this in place to keep the trousers in place, this will be hidden by the uniform tunic. The picture on the right shows the uniform tunic once it has dried, after I have also given it a wash of some Brown pastel chalks like I have done with my other German uniforms, how I did it is on this page. As I have found that this helps to get an aged look to the uniform, before I have then given both the tunic and trousers a light drybrush of some Light Sand weathering powders. And as shown this to me has helped to remove the new look that the uniform originally had, and it has now a slightly better and worn look to it. 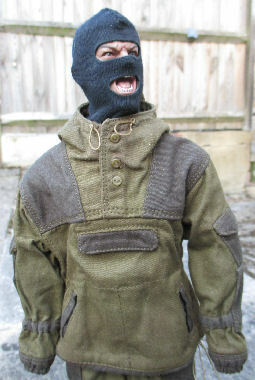 I also gave the balaclava a light drybrush of the Light Sand weathering powders, which has again helped to lose the new look it had, as well as highlighting the holes for the eyes and the mouth. 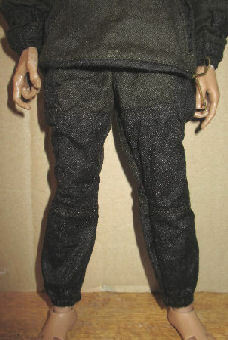 The boots I used for this figure were made by Virtual Toys for the Revenger figure, Picture 12. below shows the new boots as I got them loose. In Picture 13. I have first given them a repaint with some Black artists acrylic paint, to add the colour to the white edges of the pleather material. 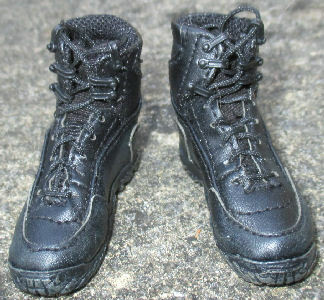 I then took out the supplied laces, as I felt that they looked out of scale with the boots and I have replaced them with a strong black thick thread I have. Which is about half the thickness of the original laces, and to me they are now more in scale. 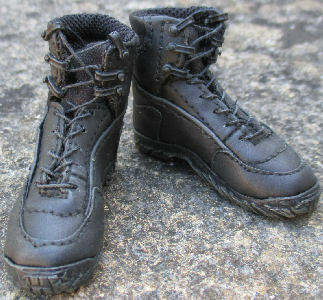 The last thing I did with the boots was to also give them an overall light drybrush of some Light Sand weathering powders, which has helped to highlight both the laces and the edges of the boots slightly whilst still keeping the Black colour underneath. 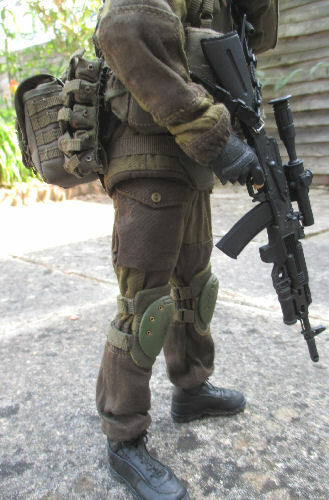 The equipment for this figure was given the same treatment as my other spetsnaz figure, where I gave it a wash of Brown pastel chalk and when dry a drybrush of the Light Sand weathering powders. 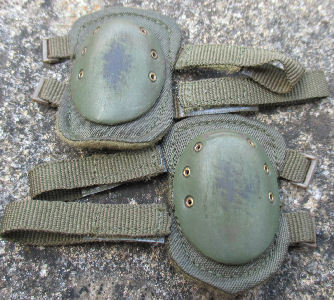 Picture 14. shows the belt kit before I have given it the pastel wash, with Picture 15. showing the result afterwards. Which has helped to take away the new look it had before. I have also had some very good help from a fellow modeller Scimitar. 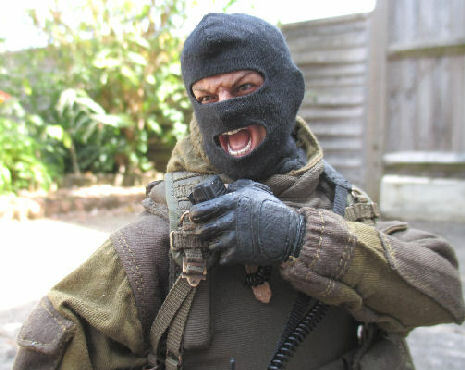 Who told me about the L2 water bottles used by the spetsnaz. LC2 canteens and covers are the standard canteens that US forces have been using for years. The distinguishing feature is the small water purification tablet pocket on the front right side of the cover. Lots of companies have made them but I think the recent ones from DAM look the best. 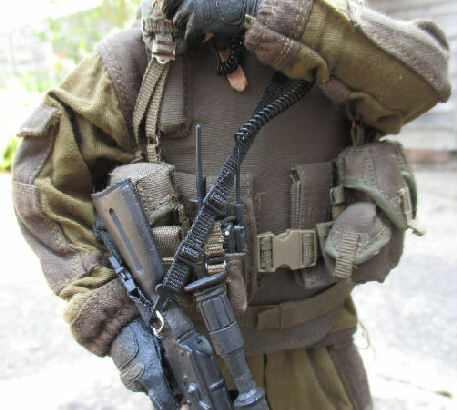 DAM has released two Russian figures with canteens. 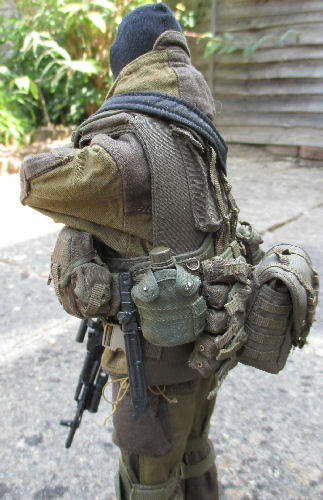 The VDV figure has a LC2 canteen but the cover is a Russian design in digital flora. 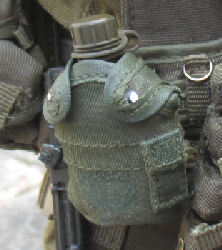 The Dagestan figure has a woodland LC2 cover with a standard LC2 canteen. 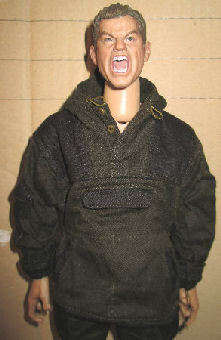 DAM has also released a number of other figures with the canteens. Those have "US" stamped on the cover but they could be used if the cover was repainted. Scimitar's reply in italics regarding the colour. Don't worry about the canteen cover. There are lots of variations in the colors of Russian cloth gear. 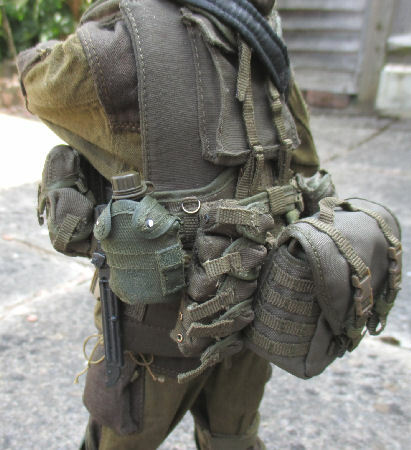 I don't know where the Russians get their LC2 canteens and covers but it's quite possible that they aren't from the same manufacturers as the rest of the web gear so color variations are fine. The one I have as shown above right, was made by DAM for an American figure which had the US lettering on it. So I had to re-paint part of the water bottle pouch to lose the lettering, and at the same time try to blend it into the original colour. But I ended up having to repaint the whole cover, as I could not get the cover colour right. This information has helped me immensely, because I was very concerned about trying to get all of the cloth equipment almost the same colour. Because with my limited resources for information, I was worried that the colours may be wrong. 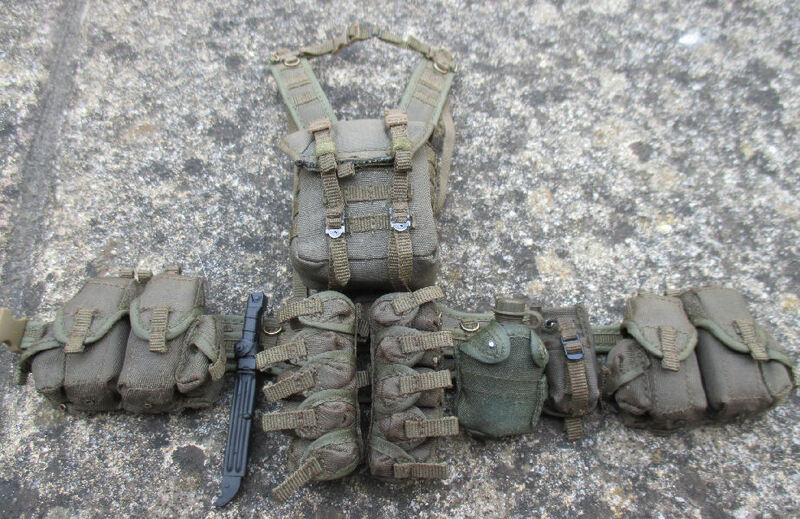 The picture on the right shows how I have assembled the AK-74 rifle that came with this set. To show how I did this I have a separate section on this page - Rifle. With the pose of the figure I had to give it a lot of thought as I was using the shouting head, and I wanted to add a sense of urgency to the figure. But I could not find a gloved pointing hand, so the only other alternative I could think of was for the figure to be gripping and shouting into the radio handset. 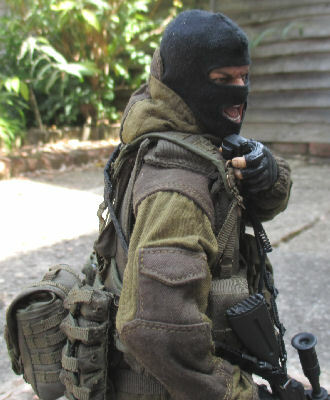 Thank you to Scimitar for all of the help I have had with my with my Spetsnaz figures.